Cash Shop is the one-stop online shop for a variety of fashion, cosmetics, pets items and much, much more. You can access the Cash Shop by clicking the red Cash Shop button on the bottom of the screen, or by using the Hotkey: `. Maple Cash - Can be purchased using prepaid card, mobile phone, payment kiosk, and credit/debit cards. Your available Maple Cash balance is displayed on the top of the Cash Shop. To add more Maple Cash to your account, click the yellow “Charge” button. Maple Point - Can be earned via certain in-game events and activities. Mileage Point - Can purchase items in the Mileage shop or to apply a 30% discount on certain Cash Shop purchases. Before buying, you can try on the item(s) by double clicking on the selected item. Your character, shown at the top right hand side of the screen will reflect the change. Items you purchased will be placed in your Cash Inventory. To use a purchased item, you will first need to transfer it to your Item Inventory. Simply double-click the item in your Cash Inventory to automatically move it into your Item Inventory. Double-click it again to remove it and return it to your Cash Inventory. Items cannot be transferred unless there is available space in your Item Inventory. You can also get a small amount of Mileage Points by purchasing items from the Cash Shop with Maple Cash. The Mileage Points are used to purchase items in the Mileage shop or to apply a 30% discount on certain Cash Shop purchases. You may add item(s) that you do not own into your “Wish List”. In addition to your regular purchases, you can gift an item to a special someone. You can also give a “Thumbs Up” to items you like and see how many other players recommend that item as well. 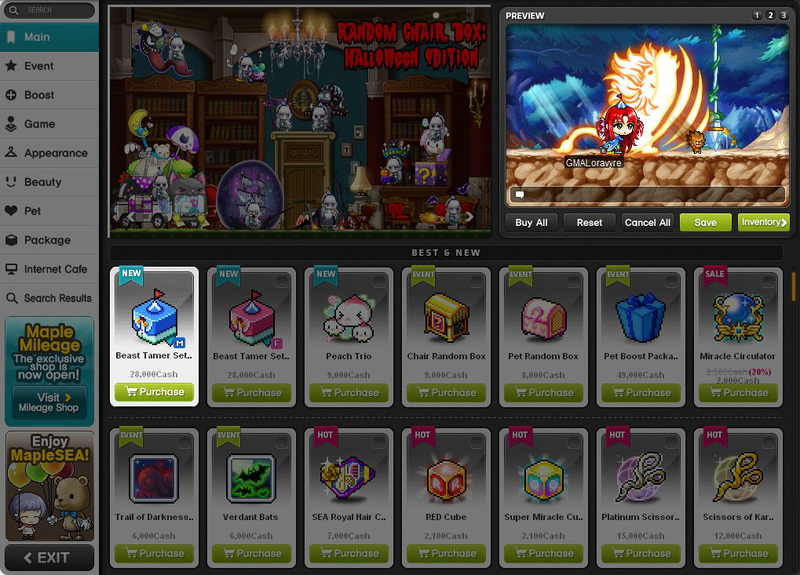 If you have received a MapleSEA redemption code, you may exchange it for MapleSEA in-game items by selecting the Coupon button on the top of the Cash Shop screen. Enter the 30-digit redemption code and receive the item in the Cash Inventory. To transfer it into your character’s inventory, double-click on the item. Note: Code cannot be used if the redemption period has expired. • Purchased items cannot be refunded or exchanged. 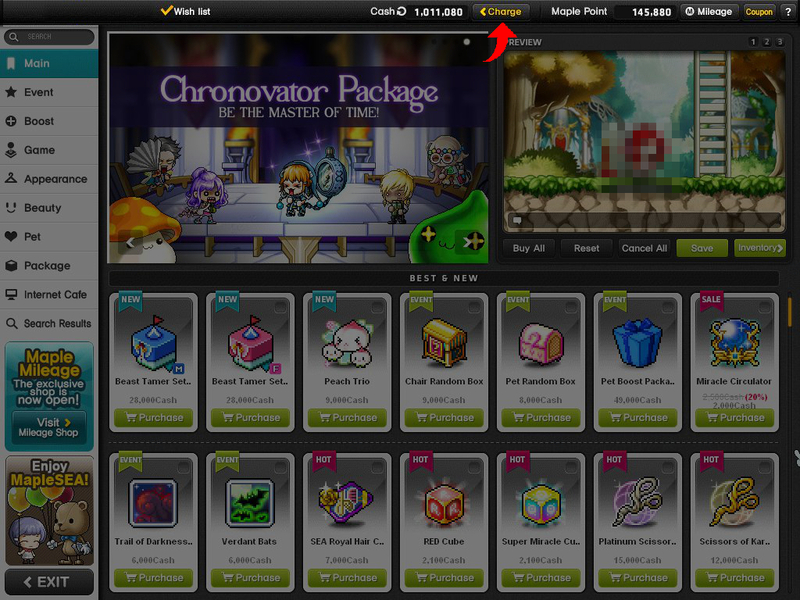 • Cash Items are not transferable between characters in different Worlds even if it belongs to the same Maple account. • Please note that some of the items are limited to gender, job, level or fame of your character. Mouse over the item to check the requirements. • Some items are time-based, and will disappear from your character once the usage period is over. Mouse over the item to check the validity before purchase. Once purchased, the duration will start immediately. • If you have any queries, please contact our Customer Support for information before purchase.